This week, I thought I’d share something really cool that my little sister did. Last year was my sister’s first year of high school in Belleville, Ontario, and she noticed that many of the world’s flags were hanging in the front lobby, including China’s. Obviously, like all Tibetans do, she looked for the Tibetan flag, but it was nowhere to be seen. One day , during one of our many skype calls, she mentioned this to me, and I think it was soon after ‘Tibet Lobby Day‘, so I was just coming off my lobby high, and suggested she set up a meeting with her principal and ask him to put the Tibetan flag up, and explain to them that as a Tibetan student, and one of many who had walked these hallways before, she was disheartened to see her country’s flag missing. She did just that, and the principal agreed to do so by the next school year. Well my sister went to her school yesterday, and guess what? 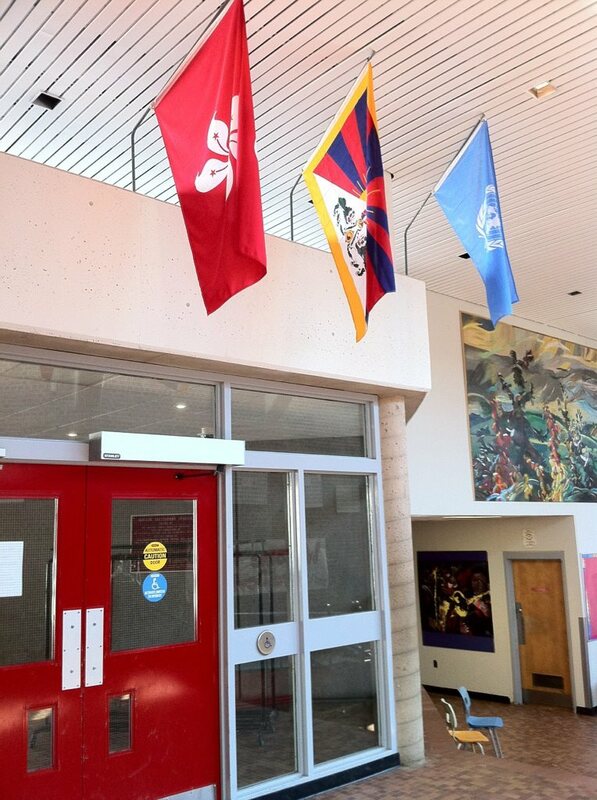 The Tibetan flag was oh-so beautifully hanging in the lobby as promised! I went to the same high school eons ago, and even back then, although the school was mostly caucasian students, there were quite a few exchange students from China at our school, and speaking to my sister, it looks like the situation remains similar. Simple actions in strategic locations like this will help expose the Tibet issue to young students, and most importantly to the Chinese exchange students, who usually come from wealthy, sometimes influential families and will one day return home where censorship and propaganda try to bury important issues like Tibet.